Designers have many brands to choose from when selecting a brand of wood door to specify for a particular project. In fact, according to Allied Market Research, the interior wooden door market is driven by advancements such as eco-friendly doors, a surge in residential and non-residential construction, and increased expenditure on home remodeling in the developed economies such as the U.S. There’s also an increasing demand for recyclable raw materials, and government support to adopt polyvinyl chloride (uPVC) due to improved energy efficiency properties. Do you select a product solely on the look you are trying to achieve or do you balance decisions on other factors? Should brand decisions be based on the goals of the building owner and their budget? What type of after sale service does the wood door manufacturer provide? Is that important to your clients? Is the manufacturer there to support the product during installation or after the project is complete? There are always some choices that are viewed as more critical than others. For wood doors, these choices might be a demand for the right “look” or the aesthetics needed to balance the motif. Or perhaps the project has more of a security focus, with safety AND functionality blended in with the considerations. Sometimes building codes can impact a designer’s selection trumping the specification decision. Building in Florida, for example, a designer has to pay particular attention to proper door and window construction to reduce water infiltration. Section R613.4 of the IRC and Section 1714.5.1 of the IBC, as an example, require windows and sliding doors to be certified per AAMA/WDMA/CSA 101/I.S.2/A440, Standard/Specification for Windows, Doors, and Unit Skylights. Evaluating how a product like wood doors is specified is essential to helping manufacturers build their brand presence with architects and designers. By tracking the frequency and placement of wood door brands in project specifications, manufacturers can begin to learn how well their brand is penetrating the design market. In addition, such tracking provides manufacturers a way to evaluate their position in relationship to competitors. The comprehensive Accountability (AIM) Architects’ Brand Preference Study conducted several years ago revealed just how competitive the wood door market is. In this unaided blind brand preference study, architects and designers were asked to list their top three brands of wood doors. That is, they were not provided a “list” of choices. They were asked to “write in” their brand from their memories. There were over 51 brands or companies mentioned by designers that were “involved” with the specification of these wood doors. Although the list of specific brands has no doubt shifted over time, the numerous choices designers have to choose from still holds true. Designers have lots of brand choices when it comes to wood doors, giving the manufacturer of wood doors a true challenge. To help manufacturers evaluate their brand position in the marketplace and understand how to penetrate the mind of a designer, it is important to first understand more about an architect’s level of involvement when specifying wood doors. How much control or influence does the architect or designer actually have on selecting a particular brand of wood door? Looking at wood doors, the degree to which architects are involved in specifying a specific brand or manufacturer varies by several factors. Not only do architects seem to balance the project budget and specific design goals; but, other factors like the type of project, the location of the product within the facility or where the facility is located could impact the brand of wood door in their preference choice. For example, in a medical facility, the type or brand of wood door may be influenced by an infection control specialist or security professional due to health and safety concerns. Only 11% of the architects surveyed in AIM’s Architect’s Brand Preference study indicated that they were not involved in selecting and specifying the brand of wood doors. So regardless of project, they ARE involved. But, it’s a level that varies enormously. Consider that 39% indicated they did not have any type of brand preference — an increase from 21% with “no preference” from a previous brand preference study. That means over a third of the architectural specification market has no preference. While architects may indicate they have “no preference,” they are, in fact, involved in specifying and recommending wood doors. How? They delegate the brand selection to the interior designer or “others” in the specification path. Many design firms today maintain a list of “approved” brands that meet their performance and quality requirements and simply refer to that list. If a manufacturer is not on “the list,” the chance of being in a specification become limited. Becoming a brand on the architect’s preferred list of brands is one of the keys to impacting a brand’s position in the specification itself. To be on a firm’s list of approved wood-door brands, a manufacturer needs to provide more than just a quality product. They need to have a history of top performance, offer premiere service and local support for their brand. What should wood door manufacturers do to enhance brand selection and preference? How can manufacturers convert “no preference” answers into specifications and recommendations for their brands? These are important questions. To answer these questions, consider what we know about specifications for wood doors in today’s environment. The key to gaining ground in specifications is to become part of the “basis of design.” This means that the architect or designer is calling out a specific brand that is used to meet the objectives of the project. To learn more about how often “basis of design” is used in wood door specs, AIM used ConstructConnect™, (https://www.constructconnect.com/), an online construction database. By searching project specifications for “wood door projects with Basis of Design,” in specific years, we can see how the specification for “basis of design” and specific brands changed (see chart). 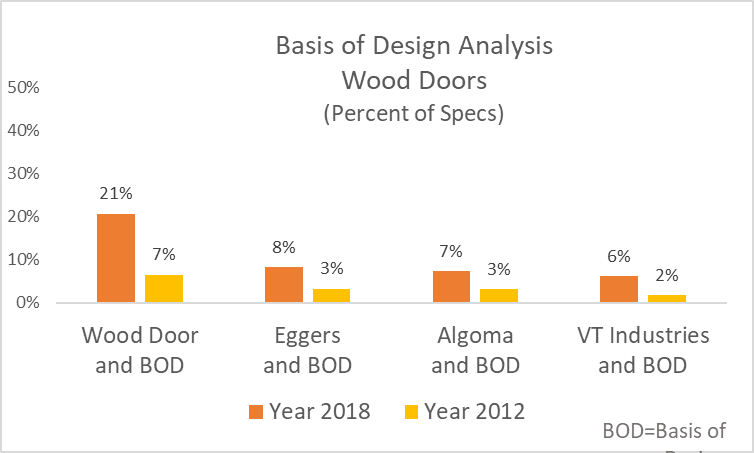 Only 21% of projects in 2018 had a wood door project that also included a brand as the “basis of design.” However, this has increased since 2012 where “basis of design” was specified in only 7% of the wood door specifications. Becoming a “basis of design” is, therefore, increasing — tripling from 2012. But, less than one-third of projects have such terminology — making the market wide open for manufacturers. This type of spec analysis can also show manufacturers how often their brand is specified as the “basis of design” and if it has shifted over a specific period of time. The market is constantly changing and it is important for a manufacturer to continuously review their position in architect specifications. While a manufacturer cannot always be sure that they are on a firm’s “preferred” list, they can evaluate how often their brand appears in the specifications and measure how often they are the “basis of design.” If a brand is found in the specifications and certainly is the “basis of design,” they are going to be on the list of “preferred” brands. The same research can be done on the other product categories or on specific brands conducted in the AIM Architects’ Brand Preference Study. Let us know where your interests are. Thank you.